Has anyone gotten cards in yet or does anyone know when we are supposed to be getting cards for the new Nintendo eShop? I have guests coming up to me asking about the pre-paid cards for the eShop that just came out for the 3DS. Just so everyone knows you CANNOT use the old DSi points cards, the 3DS eShop uses a cash based system and not a points based system like the Wii/DSi shops. I haven't seen any cards come in yet for my store, but I didn't know if it was just me or if anyone else got in cards yet. The best I can do is tell the guests to wait or just use a credit card. Apparently they are already at Best Buy. 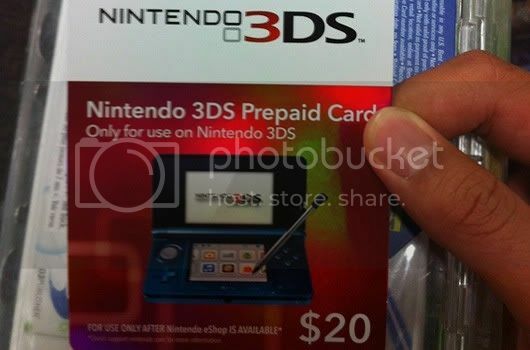 It will prolly end up on the same endcap where the other prepaid cards are or where all the DS accessories are.